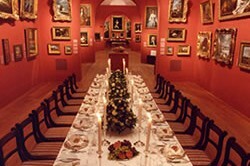 Dulwich Picture Gallery is England’s oldest purpose-built public art gallery. Set in the beautiful eighteenth century village of Dulwich, the Gallery is an elegant and sophisticated venue with a number of spaces available for hire. 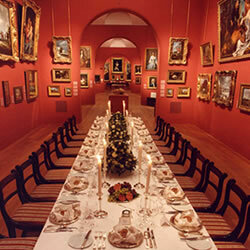 The gallery itself is a flexible space where you can enjoy a sit-down dinner for up to 120 or a canapé reception for up to 350 in the company of priceless Old Master paintings. Alternatively mingle in the contemporary designed cloisters, with easy access to the landscaped gardens where drinks can also be served. For a more relaxed buffet or reception you can hire the Linbury Room which can accommodate up to 60 for a dinner or 100 for canapés. It is also possible to erect a marquee in the gardens for larger events, providing space for up to 220 guests for dinner. Click here to view our Dulwich Picture Gallery Slide Show.